In fact, 46.8 per cent of respondents to the annual Canadian Lawyer Corporate Counsel Survey said the billable hour is still the main arrangement they have with their primary law firm, followed by a combination of billable hours and flat fees at 31 per cent. “I thought I was missing the boat on AFAs, but I see it’s one of those things that is discussed all the time but has not really caught on yet in a big way — I have a feeling it probably has more with the bigger firms and with their bigger clients,” he says. This year, 218 law department leaders from Canadian corporations and government participated in the Corporate Counsel Survey. 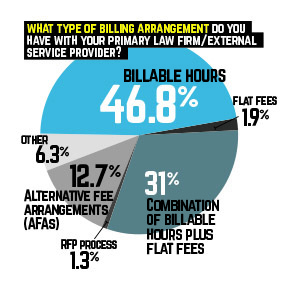 On the question of what arrangements they use in addition to the billable hour, respondents indicated they use AFAs (12.7 per cent), flat fees (1.9 per cent), and requests for proposals (1.3 per cent), as well as “other” (6.3 per cent) options. Many said they were using a combination of billable hours, RFPs, and flat fee arrangements. Felicissimo is part of the majority of survey respondents who work in legal departments with less than five lawyers — 56.4 per cent — and perhaps carry a little less budget muscle than, say, the big five banks, which have been the primary drivers of AFAs including value billing. Of the 12.7 per cent of in-house who said they do use AFAs, 66 per cent said 25 per cent or less of the work they send out falls under an alternative arrangement, while 16 per cent said between 50 and 75 per cent is compensated based on an AFA. Fixed fees for consistent types of work were the most popular AFA with 62 per cent of respondents indicating it was the method they used most, followed at 58 per cent by flat fees for a prescribed phase of work or bundled portfolio of work. with external counsel and that’s something the firms proposed. “They have flat fees for trademark filings, copyrights, etc.,” he says. With the immigration firms he works with, charges are flat fees per file. “We’re in the process right now of applying to bring someone from Colorado to our office and a mid-size Montreal firm is assisting with the matter and all their fees are flat fees. I really liked that — I’ve been reaching out often with questions and it’s good to know when it’s a flat fee. We try to have monthly caps on certain matters, but I proposed a success fee to a German lawyer and he implied that kind of arrangement is prohibited there,” he says. For those in-house counsel using AFAs, 68 per cent say they introduced the idea to their law firm, while 28 per cent said they discussed it mutually with their law firm partners, and three per cent said their firm introduced the idea. For large Canadian companies with global operations, the use of AFAs has been more common and going on for a longer period of time. Kerry O’Reilly Wilks, head of legal, North Atlantic & U.K., for Vale Base Metals Business, says Vale has been looking at AFAs for a number of years. With a team of 10 lawyers in Canada and more than 50 globally, Vale is by no means the largest in-house department in the country. “I think it’s because we are so global and we’re constantly dealing with international firms and a lot of American firms, and probably because there is such fierce competition, especially at the higher end of those markets and they are more willing to be creative and think of ways to win your work, even if you are under budgetary restrictions,” she says. Vale would prompt its Canadian firms to offer a different kind of arrangement. “A number of years ago, it was fairly novel in the Canadian legal arena — they weren’t doing it and were not all that open to it. But certainly more recently, it is one of the first conversations we have with firms even if we’ve had a long-standing relationship with them, to have the conversation at the beginning of a new matter,” she says. Especially in a time when commodity markets are not performing all that well, O’Reilly say it’s important for firms to be open to negotiations on fees. “It doesn’t mean that litigation stops — your project pipeline might slow down, but your litigation doesn’t necessarily slow down. So you have to come up with creative solutions with law firm partners to continue to be able to retain great lawyers and the best advisers, but in a way you can accommodate restrictions in your budget,” says O’Reilly Wilks. Of those in-house who answered this year’s survey, 61 per cent said the volume of legal work carried out by their department and external counsel combined was likely to grow in 2016 from 2015. Other responses show in-house counsel are also choosing external legal services providers based on their knowledge of specific lawyers (67.4 per cent), followed by industry/practice area expertise (49 per cent), technical expertise (43.7 per cent), and law firm reputation (24.2 per cent). In-house are also showing their preference for using boutique law firms with 72.6 per cent saying they use smaller specialized firms in the area of IP, tax, employment law, and other areas. National firms still led the pack at 75.3 per cent, with regional firms at 62.6 per cent, global firms at 32 per cent, and alternative firms at 6.6 per cent. LPOs were last at 3.3 per cent. The responses to the survey came from a cross-section of departments. Similar to last year, 11 per cent came from legal departments with $10 million or more in legal spending in the last fiscal year, 6.8 per cent with $5.1 million to $10 million, 7.8 per cent at $3.1 million to $5 million, 22 per cent at $1 million to $3 million, 12.8 per cent at $501,000 to $1 million, 22 per cent at $101,000 to $500,000 and 17.4 per cent spent less than $100,000 in legal costs. Responses came from a variety of sectors including government (21.6 per cent), financial (20.1 per cent), resource-based (13.3 per cent), industry/manufacturing (12.3 per cent), services (10.5 per cent), non-profit (8.7 per cent), technology (6.8 per cent), and professional services (6.4 per cent). Litigation remained the No. 1 area of practice in-house counsel outsource at 73.9 per cent — up from 69.8 per cent last year but still below the 2013 number of 82.4 per cent. Employment law remained in the second spot at a steady 46 per cent. Mergers and acquisitions came in third at 31.9 per cent, up slightly over last year’s number of 27.8 per cent. Intellectual property jumped to 27.8 per cent, up three per cent over last year.